What’s New/Best Seller • AutoDryer — Smart Dryers featuring DryerIQ Technology. Advantages/Features • The AutoDryer line of car wash dryers combines tried-and-true manufacturing principles with cutting-edge design. The blower section is cast aluminum (not plastic) and is engineered to provide superior air channeling through its tangential design. The system provides up to 20 percent more drying pressure and airflow, and incorporates Dryer IQ technology that yields tremendous energy savings. AVI’s Dryer IQ can cut electrical consumption by an average of 70 percent through its load balancing system and variable speed control. Delivery/Installation • Available through the AVI Car Care distributor and installation network worldwide. 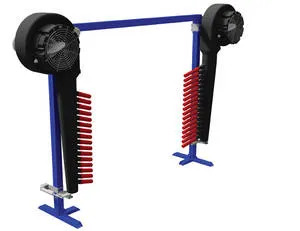 What’s New/Best Seller • Sonny’s Mammoth Air Drying System. Advantages/Features • Sonny’s Mammoth Air Drying System was designed using the most advanced airflow models resulting in the best blower available to dry the sides of vehicles from the wheel to the top of the highest SUV. The system features high velocity airflow positioned closer to the vehicle for effective finishing. The exclusive manifold design directs 80 mph of high flow air from each flexible trunk for the strength to dry under mirrors without flipping them. Full range performance eliminates water stuck in seams. It dries rims and tires for improved dressing application. The plastic housing has no seams or plastic welds that are prone to cracking. The available flip option allows the blower to flip on the rear of the vehicle for a great rear dry. Advantages/Features • Belanger’s patent-pending AIRIS AirFlow Management System delivers industry-leading energy savings of over 56 percent. With shutter-like precision, the AIRIS opens or closes airflow in the blink of an eye. When open, AIRIS delivers over 97 percent airflow efficiency that’s half as restrictive as most competitors. When closed, AIRIS allows absolutely zero airflow, using as little as 2-hp per dryer. The system can be installed on all new or existing Belanger Dryer systems. With over three decades of experience in the industry, Aerodry has built a reputation for product excellence, integrity, honesty, and no gimmicks. What’s New/Best Seller • Custom and Standard Designs with Sound Reduction. Advantages/Features • Innovative designs increase performance and always include internal sound reduction. Units are freestanding and require minimal maintenance. All components are guaranteed new and proven suitable for harsh car wash conditions. The system has been successfully installed in all types of washes including auto plants, vehicle processing locations, and truck/train/bus facilities. Carolina Pride Carwash Systems and Solutions has been providing car wash operators throughout North America with industrial grade wash systems for over 50 years. Carolina Pride offers many services, including car wash payment and management systems, Turbo Dry™, Performa™, Express, and the newest OPTIMAX Series of self-service wash equipment. What’s New/Best Seller • Turbo Dry II Self-Serve Dryer. Advantages/Features • Carolina Pride’s Turbo Dry II is more energy efficient, compact, quieter, and has a longer motor life than any other dryer in its category. With a super tough nozzle and elimination of the dump valve, it is a powerful drying system that’s faster, touchless, and delivers a spot-free dry every time. Each system comes complete with a 3-hp motor, dryer boom, all necessary hoses and couplings, nozzle and nozzle holder, and in-bay Turbo Dry signage and meter decal. Optional boom extension, banner, and strip decal for wash instructions signage is available. 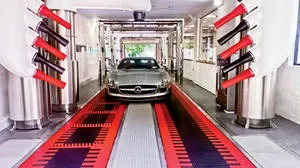 Coleman Hanna Carwash Systems, with 50 years of experience and installations in over 75 countries, offers a complete catalog of innovative car wash equipment including tunnels, automatics, self-serve, and support equipment. What’s New/Best Seller • High Efficiency Stainless Steel (H.E.S.S.) Air Dryers. Advantages/Features • All new stainless steel housings in the H.E.S.S. EQ Dryers provide added durability, resistance against corrosion, and an easy-to-maintain appearance available with an optional stainless steel nozzle. The corrosion resistant intake cone and stainless steel inlet screen adds staying power and longevity. Improved impellers contribute to power efficiency, smooth operation, and improved motor life. Customer/Operator Support • Worldwide distribution and support. Price • Call for a quote. The Dryer Pros specializes in innovative, high performance dryers for most applications from in-bay automatics to express tunnels as well as truck and bus washes. All TDP dryers are available with a variety of performance enhancing options that include oscillating nozzles, dual-port “flip” nozzles to dry the backs of vehicles, and the patented energy-saving Air On-Demand system. What’s New/Best Seller • Cyclone Dryer with Oscillating Nozzles. 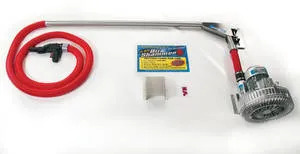 Advantages/Features • Originally introduced to the car wash industry in 1992, the patented oscillating nozzle quickly gained wide recognition as a major improvement in drying performance. The technology is now utilized in The Dryer Pros new Cyclone dryer. Available in 4- or 6-nozzle models, the Cyclone provides maximum drying in minimal floor space. PECO Car Wash Systems manufactures premium car wash systems customized to meet the needs of any location. Peco is an industry leader in providing equipment and resources car washers need to be successful. What’s New/Best Seller • PECO SC04 Shammy Dryer. Advantages/Features • The SC04 Stainless Steel Shammy Drying Wash-Along Curtain is designed to reduce towel-drying labor and achieve complete drying coverage. 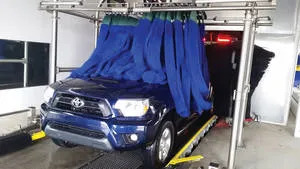 The curtain uses a special “self-drying” microfiber drying material that gently, yet efficiently picks up remaining water beads after the vehicle exits the dryer area. Built with stainless steel because it’s stronger, lasts longer, and is easier to maintain. Units come equipped with a retract system for pick-up beds. Customer/Operator Support • PECO has over 50 years of experience and a worldwide dealer network. 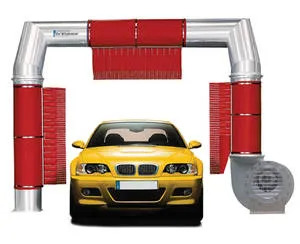 As a leading manufacturer of car wash drying systems, Proto-Vest innovations have been awarded over 40 patents on various products with several more pending. 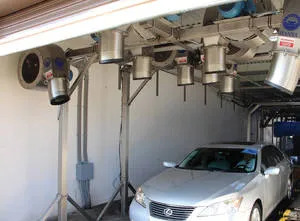 Proto-Vest car wash dryers can improve the efficiency and profitability of any car wash from an in-bay automatic to a high volume tunnel application. Along with an extensive line of dryers, a variety of options are also available that can be added to any Proto-Vest dryer, including products for noise reduction and energy savings. What’s New/Best Sellers • Proto-Vest WindShear Dryer. Advantages/Features • The WindShear is a standalone, touch-free drying system that is ideal for low and moderate line speeds. The dryer features only one 30-hp motor along with Proto-Vest’s patented design, offering high efficiency drying while reducing energy costs compared to similar dryers in its class. The three Proto-Duck air delivery bags maximize drying surface coverage, thoroughly drying the top and sides of the vehicle as it passes through the dryer arch. By combining the WindShear with the Silencer Package, the dryer can meet and exceed OSHA noise regulations. All Proto-Vest dryers come with the option of air bag colors, red, blue, green, or black. Custom colors are also available upon request. 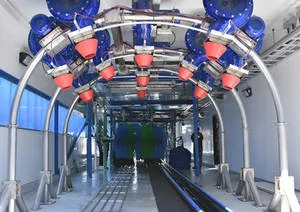 MacNeil Wash Systems manufactures a complete line of quality car wash equipment for the tunnel car wash industry and for the automotive dealer, fleet, and rental markets. What’s New/Best Sellers • Tech 21 Drying System available with PowerLock Air Valve and SMART Nozzles. Advantages/Features • The Tech 21 Drying System is fully customizable to meet the unique needs of today’s car washes, giving operators total control over the drying process. The optional PowerLock Air Valve is an easy add-on to any new or existing MacNeil drying producer, and is now available with a retrofit adaptor to connect with most other manufacturers’ drying equipment. The system reduces dryer energy consumption by up to 30 percent, while at the same time decreasing dryer noise levels. The unit eliminates the danger of debris flying out of pick-up truck beds. Both the 10-hp and 15-hp models can be fitted with SMART Nozzles to create enhanced drying on hard-to-dry areas like side mirrors and vehicle backs. The Tech 21 is available in 20-, 30-, or 40-hp package systems, or can be customized as a Pro-Build system to suit a wash’s specific needs. Customer/Operator Support • MacNeil distributes and supports its products through a network of international distributors. Oasis Car Wash Systems manufactures dependable, high-speed, and efficient car wash equipment with the investor in mind. What’s New/Best Seller • ADAPT Drying System. Advantages/Features • Car wash owners looking for an onboard drying system that is compatible with their existing equipment now have an option. 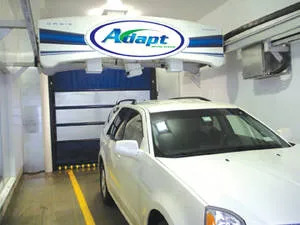 With the ADAPT Drying System, operators are no longer limited to just a freestanding dryer — the system will interface with any in-bay automatic car wash on the market. Customer/Operator Support • Worldwide service and distribution network. Since 2004, Motor City Wash Works has manufactured conveyor car wash equipment, parts, and supplies in Wixom, MI. Wash Works is well known for its innovative products like the Dry N Shine, Color Skinz, and the High Pressure Axis Arch. 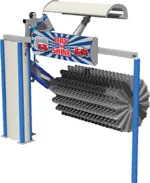 What’s New/Best Seller • Dry N Shine — Mechanical Drying System for Conveyor Car Washes. Advantages/Features • The Dry N Shine is a friction drying system that uses super absorbing drying material to wipe water droplets from the surface of vehicles. The Dry N Shine offers great customer appeal and loads of added value. It is able to effectively remove the last 5 percent of water droplets still remaining on the surface of vehicles directly following forced air dryers. It consistently produces dry cars, one after the other, all day long, while quietly using less horsepower and offering exciting new revenue opportunities. Delivery/Installation • The Dry N Shine System is available through Wash Works’ extensive local distributor network. Customer/Operator Support • A team of technical support experts and engineers can immediately answer any operating questions. All manuals are online. Pricing • The Dry N Shine packages start at $18,000. For 13 years Diskin Systems Inc. has developed the concept of self-service in-bay drying. These dryers are put inside of a self-service bay and wired to the selector switch to make drying easy for the customer. What’s New/Best Seller • Super Air Shammee II. Advantages/Features • The new model is a regenerative style blower. It uses three-phase power and is 5-hp. 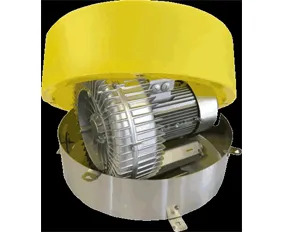 When mounted in the bay it is much quieter and more energy efficient. The additional horsepower adds a 20 percent performance increase in drying effectiveness. This kind of drying power requires a safety mechanical trigger to prevent the nozzle from blowing around inside the bay if the customer drops the nozzle accidently. 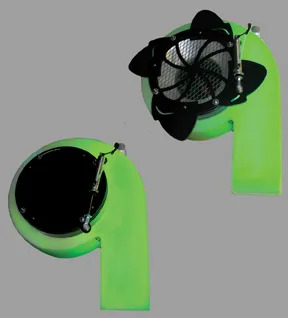 A boom and any color dome are available. NS Corporation has been designing and building rugged, dependable vehicle wash systems since 1961. Located in Inglewood, California, NS Corporation is the largest vehicle wash manufacturer on the West Coast. What’s New/Best Seller • The Drying Agent. Advantages/Features • The Drying Agent was designed with wrap around brushes and constant curtain movement to provide a gentle treatment that eliminates pesky droplets. DryTex® material provides the shine. 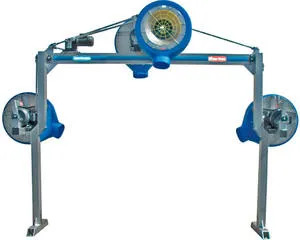 Features include: oscillating curtain and wrap around brushes to dry front, sides, and back; on-board curtain wringer with water containment and discharge; self-drying spin mode for up to 100 cars per hour; programmable self-drying mode; state-of-the-art drying material; and it requires only 10’ of tunnel space.